We'll call this "The Summer it Rained A Lot"
I'm trying out different names to describe this summer in future years. So far, the name that seems to fit the best is "The Summer it Rained A Lot". It seems like we have an hour of sunshine, and then it gets cloudy and rains for days. An hour of sunshine, then days of rain. I'm sure it hasn't been that much rain but it has been more than the normal amount. Unless something changes, and the forecast for the next ten days seems to indicate it won't change, this really is going to be "The Summer it Rained A Lot". My apologies to all those out west for whom this is most assuredly not "The Summer it Rained A Lot". All the rain is making my cucumber plants sulk and look puny and diseased, which is because they are puny and diseased. They don't like all this rain. I've picked two little cucumbers so far. On the other hand, the green beans seem to think all the rain is just great. I've picked two big messes of beans. You do remember a big bowl of fresh picked beans is called "a mess of beans", right? And there are more beans to pick. I'm going to have to freeze some beans to eat when it is cold and snowy and icy and we are all sitting around the fireplace telling stories of "The Summer it Rained A Lot". On the tomato front, the cherry tomatoes are slowly ripening. They take their time when it is raining it seems. The other day, I picked the first big tomato. It was an orange one, 'Chef's Choice Orange F1', from a plant I received from All-American Selections to grow in my garden. By my calculations, it ripened about three weeks earlier than I should have reasonably expected it to and this caused me some consternation. (Insert image of me with a sort of happy look on my face followed by a look with a furrowed brow while I thought about my dilemma in having the first big tomato be an orange variety.) Should I display the orange tomato on the satin pillow reserved for the first big ripe tomato of the season? It was the first big tomato, no doubt. But it wasn't a red tomato. I debated what to do and finally decided I would slice it and put it on an antique china dish that once belonged to my grandmother. And now I have a new tradition. 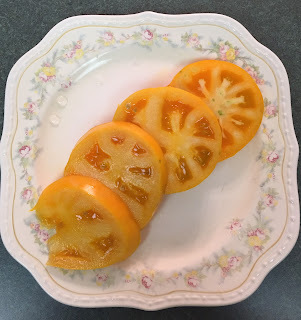 I'll display the first non-red big tomato of the season on grandma's plate and I'll continue to display the first red big tomato on the satin pillow. But I won't slice the red tomato first as that would get a tad bit messy. For those wondering, I think it will be a few more weeks before any tomatoes turn red. After all, this is "The Summer it Rained A Lot". In other news, we did manage to string together a few sunny days last weekend, but we are back to rainy days again. That's why this is "The Summer it Rained A Lot". The rain sure makes everything grow well. I was in Indiana visiting family on Monday and Tuesday, just in time to get drenched Tuesday...and drove all day in the rain away from Indiana on Wednesday. The sun broke out of the clouds just as I turned off the highway towards Manhattan Kansas. Must be some sort of sign. It rained here in southeast Michigan again yesterday. More on the way for tomorrow night. Least I do not have to water anything. I had named this summer, "The Summer of Mosquitos", which goes well with your name. In past years I would come home from work and spend my evening hours in my garden- if it wasn't too hot I'd do garden work and on those really hot, sticky nights I'd sit still and craft or paint until it was too dark to see. This summer is different...as soon as I step out from my back door I am attacked by swarms of mosquitos. The same when I go on my nature hikes. It doesn't matter if I have on insect repellant, they just swarm and buzz around me until they find an unprotected spot. I totally blame all this rain and hope the neighborhood bats are doing their jobs. It's definitely a weird summer out here in Seattle, where June is usually murky, chilly, rainy, and overcast and summer doesn't get rolling til after July 4. Steady 80s and 90s, virtually no rain in June. Had to water trees for the first time ever in 26 years because they're yellowing as if it's autumn and dropping leaves. Flip side is that cherry tomatoes are ripening--that never happens til August, usually! I have family in Cali that would so love our rain. And, I am about ready to send it. My roses do love it though. But, I can tell you I feel the need to do a bit of research on jungles and rain forests. :) Lovely pictures! I'm not far from you here in central Ohio, so we have the exact same weather. Every summer I beg for rain, and now that I finally got it, I'm not loving it! I do like the rain, I'd just like it come and go evenly, not just come and stay. My veggies are crying out for sunshine, but still, I'll soon be eating my first tomato. Some of that rain has gone around my area. We have had all the cloud cover. Our tomatoes are coming very slowly, one at a time. Peculiar at this time of year. I think this should be the official name. I called last summer "the perfect summer," because we had just enough rain and often enough to keep the garden looking beautiful. This year I am just hoping nothing gets drowned. Your garden looks fabulous. Your tomato looks delicious. Here with a mandatory water reduction of 36%, it's dry, dry, dry. Enjoy that rain for me!